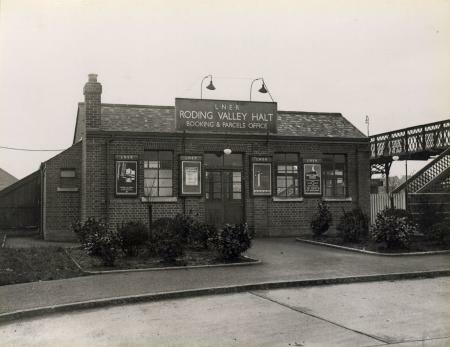 Roding Valley used to be Roding Valley Halt according to Wikipedia (https://en.wikipedia.org/wiki/Roding_Valley_tube_station). Being my local tube station, I've found that in almost all cases, there's always member of staff. They'll be in the office if they're not making routine checks or standing on the outer circle platforms as trains arrive and depart. My understanding is that stations that were distinguished as halts were built with less permanent features and limited facilities. Roding Valley Halt was merely two platforms with a shelter on either side. It had far less to show for itself compared to neighbouring stations Woodford and Chigwell. Being my local tube station, I've found that in almost all cases, there's always member of staff. They'll be in the office if their not making routine checks or standing on the outer circle platforms as trains arrive and depart. 'Halt' was dropped from the name when LT commenced operation of services on the loop and both platforms were rebuilt.